If you’re looking to buy or sell a home in the USA, weekends in the real estate business offer a particular opportunity: the open house. This is a free, one-day event held by a real estate agent to show a home that is for sale to any interested buyers. Basically, people can tour a home without an appointment and look around freely. Who doesn't like looking around in other people's homes? 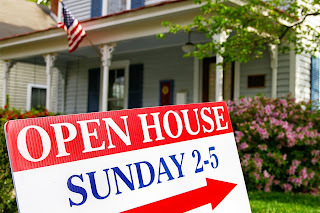 Open houses, normally held on weekends, are a tradition in the real estate business. Real estate agents place newspaper ads and post signs near street corners to attract drive-by traffic. During the scheduled hours of an open house (usually 2-3 hours in the afternoon) the doors are open so just walk in. The owners must be away, leaving the home clean and free of clutter, while the agent greets visitors, offering informal tours and fact sheets about the home. Times are changing and open houses are less effective than in the past. Nowadays there are many tools available for showing homes online and via other marketing techniques. However, I had a very positive experience at an open house because that is how I found my new home. It was an informal way to look around without any pressure. Are there open houses in the country where you live?